Single Serve Private Reserve is an ideal initiation to the magnificent world of pure premium teas. This Private Reserve Collection is designed to provide a delightful insight. A single serve of Maharaja Breakfast, Mint Melody Green Tea, Organic Himalayan Green Tea, Original Masala Chai Tea, Himalayan Oolong Tea & Turmeric Spice Tea has been assembled to suit an array of palates, and moods. An eclectic conversation starter, this is a gift is the perfect classy fusion of old-world repute and modern sensibilities. Explore the entire range of Green Tea available on Nykaa. 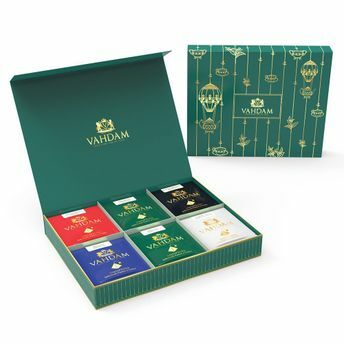 Shop more Vahdam products here.You can browse through the complete world of Vahdam Green Tea .